What's happening here anyway? How are the square and the circle changing? What controls their change? Host a brief argument. Some students may claim the area is held constant. Some may go for the perimeter. Have students restate each other's ideas. Don't settle the question just yet. Guess where the circle and the square have equal area. Make sure everyone is on the same page. We're talking about the point where the circle is tangent to the square. Once everyone has their three numbers guessed. Have everybody share out. Locate the highest answer in the class. Locate the lowest answer. Now ask them to take their guess and calculate the area of the circle and the square at their guess and find out if they were right. If students finish quickly, tell them they should pick a different guess and see if that one is right. Now have them put an x wherever they previously had their guess and put them in the following Desmos graph. How would the point change for Circle-Triangle, Circle-Octagon, and Circle-Circle? How do you know? Rephrase our original question using words only. is there a time when the areas are equivilant? When are they the same size? When is the sum of the area of the circle and of the square maximized? When do the circle and square have the same area? What's the relationship of the size of the two shapes? Is the area of square and circle equal when the intersection of the two shapes is at the midpoint of the line segment? WHat is the relationship between the side length of the square and the chord? At what point is the total area the largest? is the length of the line the same of the perimeter of the square plus the perimeter of the circle? Are we comparing the areas? At what point is the area of the square equal to the area of the circle? What is the length of line and size of circle and square? is the circumference of the circle the length of the square? How is the area of square and circle related? How do the perimeter of the full-sized square and the circumference of the full-sized circle compare? when will the areas be equal? Is the relationship of the perimeters proportional? whats the relationship between the perimeter of a square and circumference of a circle? 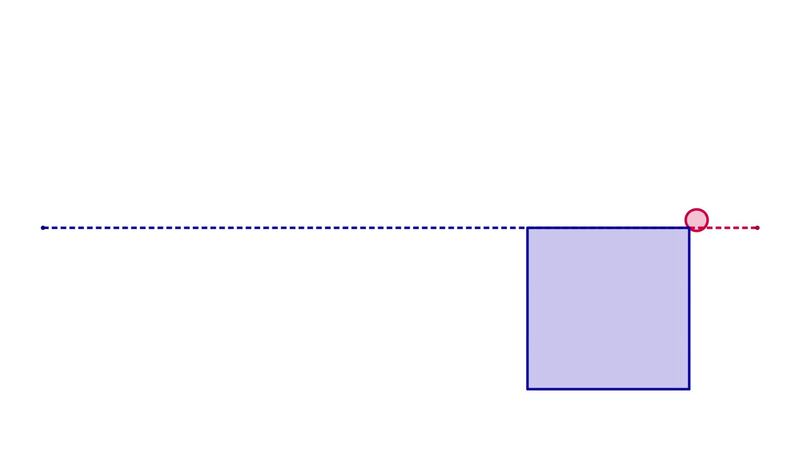 Does the amount of line left represent the perimeter of the object? Is the total area the same ? is the square equal to the circle? When will the square and the circle have the same area? How does the width of the square relate to the area of the circle? What is the maximum possible area between the two figures. At what point, do the circle and the square are equal in area? At what point is the diameter of the circle equal to a side of the square? When is the area of the square and the circle the same? When will the square and circle have the same perimeter? when is the perimeter of the square equal to the circumference of the circle? How are the areas changing? Why does the circle go partially below the line, whereas the square does not go above? Are the perimeters of the shapes equal to the length of the line? When are the areas the same? What's that circle doing next to that square? When do the square and circle have the same area? How do the areas compare? what is the box and the red circle? What's the difference between circumference and perimeter? when are the areas equal? How long is the initial line? Why is it getting bigger and smaller? Is the square's perimeter the same as the circumference of the circle? what is the relationship between the circumference/area of circle/square? When will the circle and square have (approximately) the same area? why is the square below the line? Can they ever share the same area? Can they share the same perimeter? Where along the line will they have the same area? Which shape has the bigger area? At which point will both the square and circle have the same area? What is the length of the original line? Are they ever the same size? when will the two shapes have the same area? For what value of x or r will the areas be approximately the same?